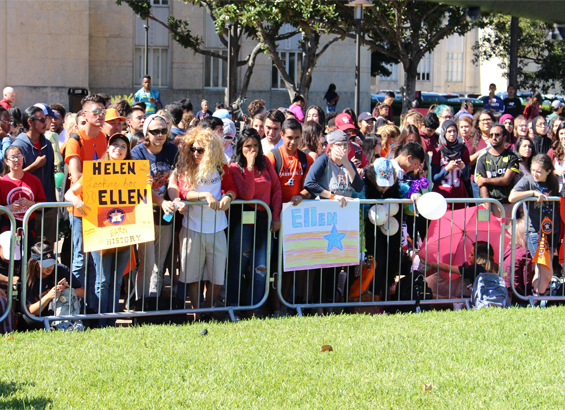 More than a thousand students filled the circle drive in front of Cullen Performance Hall Tuesday morning while Ellen’s production crew set up equipment including cameras, speakers and monitors. This is the second time Ellen has filmed a portion of her show at UH. In February, during Super Bowl week, her show staged a football game at TDECU Stadium between her producer and several retired and active NFL players. 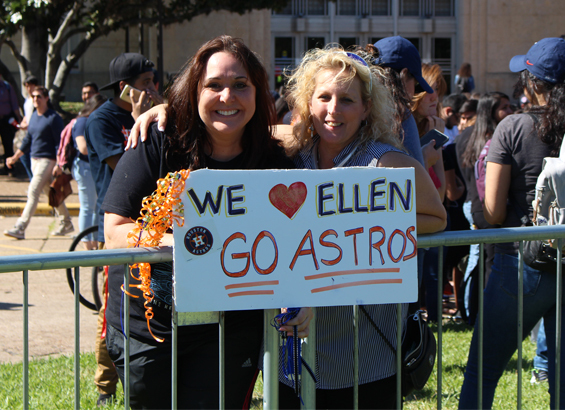 More than one thousand University of Houston students and Astros fans eagerly gathered in front of Cullen Performance Hall on the UH campus Tuesday afternoon for a chance to appear on the Ellen DeGeneres Show. The Houston Astros are in the World Series for just the second time in franchise history. They are set to take on the Los Angeles Dodgers, a team that is back in the Fall Classic for the first time since 1988. Combine America’s pastime with a city that has rallied around its team following a devastating storm — add free tickets to a World Series game and arguably the most popular talk show host in the world — and needless to say the UH campus was feeling the frenzy. “This is a great opportunity to show support for our hometown Astros while also welcoming such a witty and positive comedienne via satellite to entertain our students,” said Mike Rosen, UH executive director of media relations. Much of the crowd scattered, taking the few hours left before the broadcast to come up with a costume. The winners will be announced during the satellite interview later today. The segments will air during The Ellen DeGeneres Show, Wednesday, Oct. 25. This is the second time Ellen has filmed a portion of her show at UH. In February, during Super Bowl week, her show staged a football game at TDECU Stadium between her producer and several retired and active NFL players. The segment was produced as the New England Patriots practiced nearby on the Cougars’ practice field.